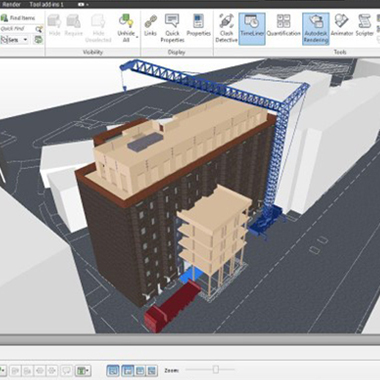 3D BIM capability, including building components, is firmly in place at Eurban. It is, then possible to extend the model to look at additional elements. Crane placements, lifting zones, set down areas, lorry unloading and installation areas are just some examples which can be plotted on the model in correspondence to their time period, resulting in 4D. Further additional elements can include site team management in terms of number of operatives, installation method, and ‘follow-on trades’ as well as an expanded view of the wider site environment. Once all aforementioned additional information is included the result would be a fully optimised site and building programme: 4D BIM which would adjust automatically when any single element of data is amended. 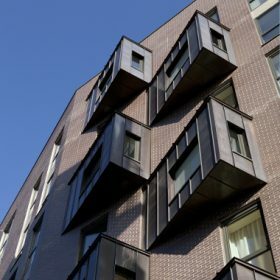 4D BIM allows the team to project and predict potential problems with the current scheme so that they can take measures to reduce risk by adjusting said scheme until the level of risk is acceptable. Using such an approach helps to avoid last-minute on-site design co-ordination and rework. Further, the delivery process can be optimised to eliminate waste of time, thereby accelerating it. 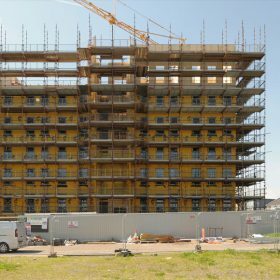 The duration on site is a key factor which can effect the successful delivery of a project. Construction sites are expensive to run and this accounts for a significant amount of the total cost for many projects. Therefore it is essential to have an optimised and reliable programme that will work on site. 4D BIM is also a powerful communication tool, applicable to many different situations. For example, meetings with local stakeholders during design, delivery and after completion. Internal handover meetings can also be more productive because everyone will understand the project in its environmental context and the whole programme can be simulated. 4D BIM can be used in any project stage. So far, Eurban has most commonly used it in stage 2: Concept Design. The Costing Model is used to create the first animated schedule. This animated schedule helps clients to understand the site process and it can also be a convincing tool to convince him / her to build in timber. The next potential opportunity to create 4D BIM for Eurban is after Stage 3: Developed Design. Before the Technical Design phase there is always an internal Buildability Workshop during which the team discusses the fabrication and on site processes. A visual, time related model helps the team to discuss all steps. Ideas can be checked. An additional benefit is that error incorporation is reduced. Finally, 4D BIM is very helpful before Stage 5: Construction. Handover meetings with site supervisors and the internal project team are simplified. The programme, set down areas, crane / lorry positions, and so on, are visual and easily understandable in context with site progress. Geometry: Parametric data in a collaborative model. Construction sequencing: Time related information associated to different elements of an information model.